On this year’s International Day of the Girl, I hope you tell the girls in your life all the things about them that you admire. Tell them how smart, how strong, how kind, how funny–how valuable they are. Look, there are a lot of horrible things happening to girls in this world, from human trafficking to child marriages to increasing prevalence of eating disorders in young ages. None of these happens in a vacuum; they’re usually tied to other social injustices (child marriage, for example, is often a result of economic desperation). Not only that, but girls suffer from social injustices unrelated to their genders and ages: racist systems, religious discrimination, conflict, poverty, and public health crises, among others. In advocating for girls’ health, happiness, and opportunities, we’ve got a lot of challenges to overcome, and, consequently, a lot of very different ways of combating those challenges. One important way is education. The UN has chosen to focus their work for this year’s holiday on girls’ education: access to transportation to school, better funding/scholarships, STEM classes, internships and leadership opportunities, integrating gender issues into school curricula, and using technology to give girls in remote areas access to educational resources. Oh, goodness. Are we on the same page for this one yet? Do we all know that Christopher Columbus was about as far from a hero as you can get? Ok, so the reasons for celebrating this holiday in the US are NOT because he was legitimately a great guy. Could it have something to do with the fact that our national identity is based on a narrative of intrepid discovery and settlement on behalf of white people? That narrative, like the popular narrative on Columbus, erases both the truth of what the Europeans did, and the perspectives and experiences of American Indians. If you’re interested in this, here’s a fun cracked.com piece. There’s a growing movement in the US to transform this holiday, and use it as a jumping-off point to talk about the truth of what happened, and what’s still happening in our country regarding Native Americans, and to devote some resources toward fighting for indigenous rights. To read up, I recommend Indian Country Today (there are some important headlines there), the UU info page, and this list of books with Native authors–or watch up with these videos about Native issues by Native filmmakers. For action items, try the FCNL list of legislative issues (call your reps when we have a government again), the UU action page, and using Columbus Day as a good excuse to spread the word about all those things you read up on. To throw money at the problem (“Comes in pretty handy down here, bub”) may I suggest the American Indian College Fund and the Native American Rights Fund? 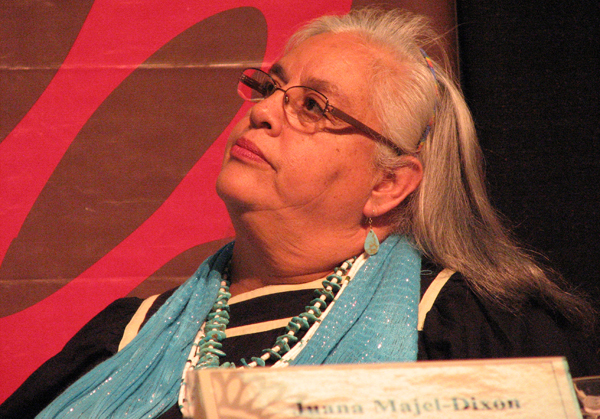 Let me tell you a little story about Juana Majel Dixon, Pauma citizen, defender of human rights and candidate for the presidency of National Congress of American Indians. She fought successfully for the inclusion of sovereignty rights into VAWA. Most sexual assaults occur between people of the same racial group; Native American women, however, are far more likely (86%) to be victimized by members of other races–presumably because non-Native rapists could attack on reservations with immunity, since tribal legal systems are only empowered to prosecute tribal members. Juana Majel-Dixon used her post on the DOJ’s Task Force on Violence Against Women to change that. I think that’s pretty awesome, don’t you? * American University is school short on sports pride but big on awesome activists to be proud of- chief among whom, for me, is Sarah McBride. Plus, obviously, Judge Judy and the woman who created “Bones”. **Howard Zinn, “A People’s History of the United States” p 1-5.